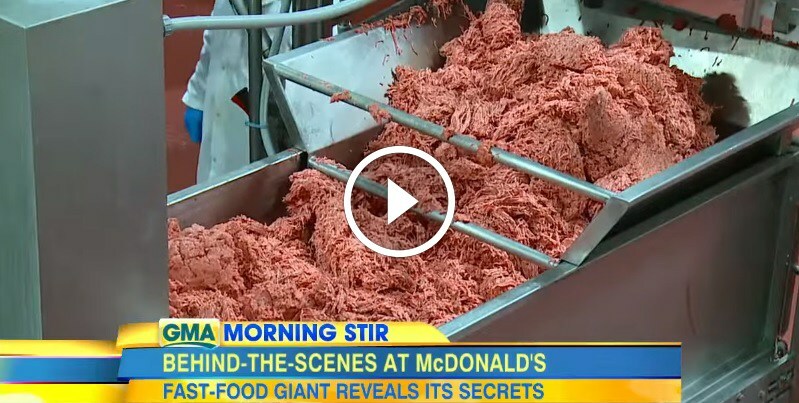 McDonald's Finally Reveals What's In Their Burgers. Yuck! Aside from the enormous amounts of grease contained in a McDonald's hamburger, the advertised ingredients are no better for you. According to McDonald's own website, this is the list of ingredients for their popular McDouble, the sandwich that you see in the above video. Ingredients: Enriched Flour (Bleached Wheat Flour, Malted Barley Flour, Niacin, Reduced Iron, Thiamin Mononitrate, Riboflavin, Folic Acid), Water, High Fructose Corn Syrup and/or Sugar, Yeast, Soybean Oil and/or Canola Oil, Contains 2% or Less: Salt, Wheat Gluten, Calcium Sulfate, Calcium Carbonate, Ammonium Sulfate, Ammonium Chloride, Dough Conditioners (May Contain One or More of: Sodium Stearoyl Lactylate, DATEM, Ascorbic Acid, Azodicarbonamide, Mono and Diglycerides, Ethoxylated Monoglycerides, Monocalcium Phosphate, Enzymes, Guar Gum, Calcium Peroxide), Sorbic Acid (Preservative), Calcium Propionate and/or Sodium Propionate (Preservatives), Soy Lecithin. - Ammonium sulfate is a chemical byproduct of steel-making and synthetic fiber production. It was the most common source of lawn fertilizer nitrogen until price increases starting in 2004 reduced its availability. - Bleached White Flour: It has been shown that alloxan is a byproduct of the flour bleaching process, the process they use to make flour look so “clean” and — well, white. No, they are technically not adding alloxan to the flour — although you will read this bit of misinformation on the Internet. But, they are doing chemical treatments to the grain that result in the formation of alloxan in the flour. Alloxan, or C4 H2O4N2, is a product of the decomposition of uric acid. It is a poison that is used to produce diabetes in healthy experimental animals (primarily rats and mice), so that researchers can then study diabetes “treatments” in the lab. Alloxan causes diabetes because it spins up enormous amounts of free radicals in pancreatic beta cells, thus destroying them. High Fructose Corn Syrup contains contaminants including mercury that are not regulated or measured by the FDA. Sodium Stearoyl Lactylate: possible side effect is food intolerance. Azodicarbonamide (Banned in the EU, Singapore, and Australia) is used in the food industry as a food additive, a flour bleaching agent and improving agent. Azodicarbonamide actually relaxes the dough so that when it is divided in large-scale bakeries under pressure, it still retains a good character. It has been known to cause allergic reactions in those sensitive to other azo compounds, such as food dyes. The consumption of azodicarbonamide may also heighten an allergic reaction to other ingredients in a food. The principal use of azodicarbonamide is in the production of foamed plastics as an additive. Guar Gum is banned by the FDA in large amounts due to reports of the substance swelling and obstructing the intestines and esophagus. Sorbic Acid: According to the National Oceanic and Atmospheric Administration, the chemical is a strong irritant and—in large enough quantities—has the potential to cause severe damage to the tissues of the eyes, skin and respiratory tract.